When last we met, Jason was trying to figure out a way to out-fox a wily mouse. Turns out, he was trying to out-fox wily mice. PLURAL. As in, there has been more than one varmint roaming around my kitchen. Saturday night, he decided to put a trap in the small gap between the refrigerator and the stove. Sunday morning, I heard a very, very nice sound: SNAP. As in, the death knell for the mouse. As in, music to my ears. He re-set the trap, you know, just in case. After church yesterday, we found out just what that case was: Mouse #2. I thought it was over. Really, I did. I mean, come ON - what were the odds that we had more that one mouse, let alone, more than two? Once again, we left the trap there, on the off chance that another mouse might show its little mousie head. So tonight, we came back home late after a meeting at church, thanked my mom for watching Anna Marie, and started getting ready to turn in for the night. And then my eye caught an odd sight: the mouse trap beside the stove was upside down. I will give you three guesses as to why that was, and the first two don't count. Jason is taking heart, though. He says they're getting smaller. "This one was itty bitty," he proclaimed, a little hopefully. He checked the dryer vent hose to see if that was the point of entry, but it doesn't appear that way. He's working tomorrow in Memphis, so we'll have to move the stove out tomorrow night or Wednesday and investigate that situation more fully. It is quite possible, or so he tells me, that the mice are living in an open space at the back of the stove, but we still don't know how they're getting in. In the meantime, guess where that trap is. Yep, you got it. I wish I could report to you, gentle reader, that my shock-and-awe campaign had rid our house of its unwanted guest. But that would not be the truth. And I am nothing if not honest, y'all. Oh, sure, we started out going easy on the little guy with the glue traps. One under the cabinet where he'd taken up sky diving on Tuesday morning, and one behind the refrigerator, where he had taken refuge after his descent from on high. Nothing. Well, I guess I should be more precise: Jason spied some, ahem, evidence that the mouse had lighted on one of the glue traps, but apparently he wasn't stout enough to actually get stuck on the board. So, we set out an old-school trap under that cabinet. A day or two passed, and we still didn't catch the little booger. Finally, Jason figured out what part of our problem is: this is no ordinary mouse. I know, I know. We all like to think that our mouse is something special, but the one who is interloping here on Tate Street really is a cut above. You see, while most mice play it safe and run along the perimeter of a room, this mouse goes for the gusto and runs right straight ACROSS the room. This makes it nigh unto impossible to place a trap where he will be tripped up by it. I'm beginning to understand all those bumbling idiot vs. mouse movies I've seen over the years. They aren't that far off base. Jason has threatened to litter the kitchen floor with traps, just like in one of those movies - but he's afraid he'd come through at 2:30 a.m. to go to work, forget about the traps, and set off a chain reaction. So, four days in, we're still no closer to catching the mouse than we were last week. I don't know who you think you are, or how you got in there. We run a clean establishment around here. But I'm issuing a cease and desist order right now. I did not appreciate it when you very nearly gave me a heart attack this morning, falling out of my high cabinet and scurrying across the floor that way. Why can't you just meander peacefully across the floor? It isn't so much YOU I'm frightened of, it's your scurrying-ness. You STARTLE me. So, here is the deal. I am offering amnesty, good for one day only. If you leave the way you came, and inform your little mousie friends that the Turner house is not one to be reckoned with, I will let you go on your merry mousie way. No questions asked. 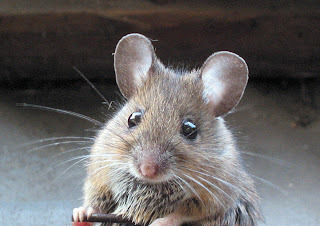 If you refuse, be forewarned that I went to Walmart this morning and stocked up on an arsenal of mouse-fighting devices. I will come at you with a quickness. You will not know what hit you. Furthermore, be advised that I will be sending you a bill for the lunch money I had to give Anna Marie today (because packing her lunch would have meant opening the refrigerator, the same appliance behind which you were lurking); the $5 worth of wooden and glue traps, along with the $2 in peanut butter to bait them with, that I had to buy this morning; and the $7 for the shirt I bought on clearance, just to make myself feel better. Because I totally wouldn't have bought THAT if you hadn't traumatized me so. Also, I will be sending a bill for whatever we eat out for dinner, because I am totally not cooking in that kitchen while you're still around. For your convenience, I accept cash, credit cards, and PayPal. I've been burned by too many rodents in the past, so please, no checks.